Your body is an amazing thing! You decide to stand up, reach across a table , go for run, climb stairs and you do it, without thought or problem. Then one day, for no apparent reason, you drop a sock, bend over to pick it up and suddenly you have dreadful pain in your lower back, you are stuck and can hardly shout for the help you need! So, there you are, wondering what you did to cause this much pain. I believe that we can, with a little education, learn to maintain our aches and pains. 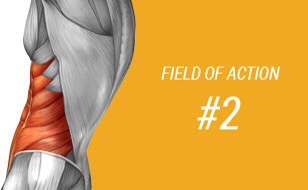 We can discover where we have built up unwanted muscle tension, weakness and tightness. I’ve been teaching, instructing and coaching real people since the 80’s. I’ve attended so many training courses and know how and why training recommendations have changed over the years. 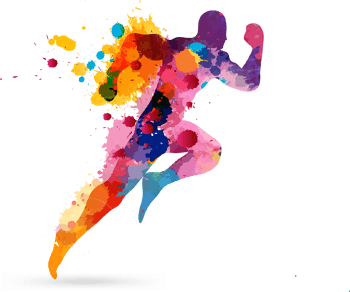 Modern scanners, thousands of peer reviewed studies, real life data from athletes in many sports all give us a good grounding on how our fantastic bodies react and adapt to the stresses of everyday activities and the sports we choose to participate in. So often injuries are ‘set-up’ by our patterns of behaviour in our everyday, we notice them when we change something – a new car, chair or desk at work. I meet clients everyday, usually through my Pilates teaching, referred by therapists of all kinds that need to maintain a healthy framework for their sport, exercise routines and lifestyle. Ok, you say, but how do I know what is a ‘normal’ framework? Your pain is specific to the centre of your lower back. You may feel pain more on one side than another. You may have been told you have tight hamstrings, hip flexors and gluteal (bottom) muscles that are lazy – my clients hear me talk about what I call ‘lazy a** syndrome’! We may joke, but it’s not funny if you have it. 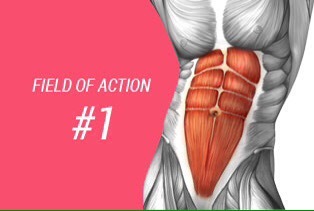 Sitting for long periods, not activating your core by using a proper bracing technique or forgetting to train your pelvic floor can all lead to low back pain, pelvic rotations and ‘Lower Cross Syndrome’, SI joint dysfunction and Sacroillitis. Lots of expensive Osteo and Chiro visits can give temporary relief, but until you learn to add your homework exercises into your exercise plan your back pain will return. I think it’s worth checking your range of motion at your hip joint. So often back problems and pain are related to hip dis function. This is what I’d like to focus on here. Find a mirror and check out your range of motion at this important joint. 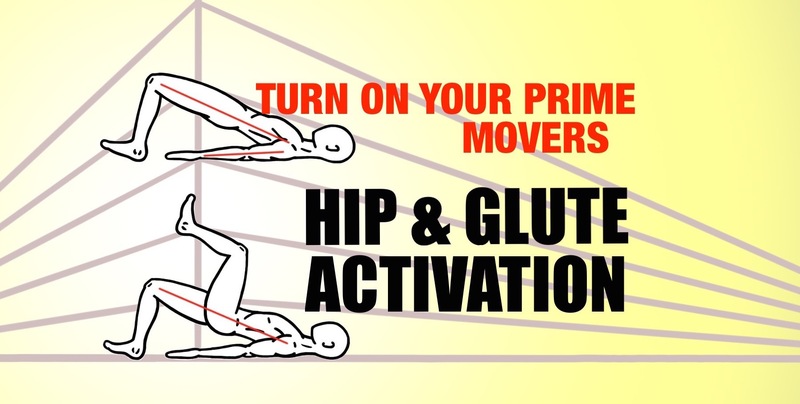 Your hip joint, pelvis and surrounding muscles work very hard all the time. To allow us to move in the many ways we enjoy all these structures have to align and remain in support of each other. If you don’t achieve this amount of movement you are setting yourself up for problems. Sometimes it’s tricky to work out exactly what you need to do so I’ll outline a range of exercises that won’t hurt anyone, but may solve your imbalances in muscle length or joint mobility. The muscles and structures on the front of your body should balance the tension in your posterior chain (back of your body) makes sense, doesn’t it, just like the ropes on a tent, they need even tension all round to stabilise. Sounds simple – but sometimes imbalances happen. Bad postural habits, movement patterns at work, driving or even in your sport can effect your alignment. If this happens the smallest action can cause enormous amounts of pain and discomfort!! I will list below the exercises, stretches and mobility work I think you should include in your exercise ‘Pre-hab’ to stay balanced and healthy. Make sure you’re warm before you stretch. Use a resistance band or old belt around your foot. This allows you to straighten your knee. 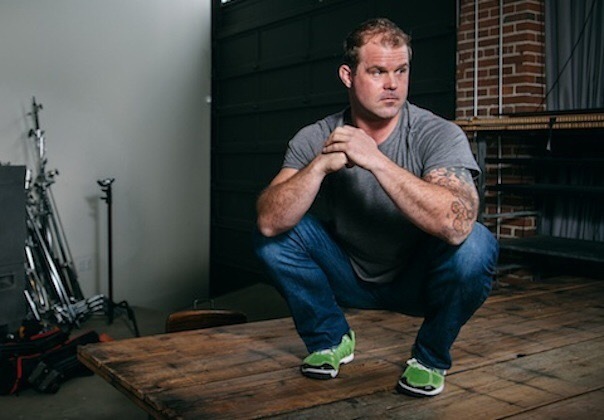 Ideally you should get a 90′ angle at your hip ( if it’s a lot more so that your foot is next to your face you will probably have the opposite problem of joint instability. In which case swap stretches for strength work. See later for strengthening work. This stretch is more focused on getting your thigh to your rib cage. Notice does your leg wander to the side of your body? Your muscles will find the line of least resistance – so try to correct this and pull your bent knee as close to your body as you can. 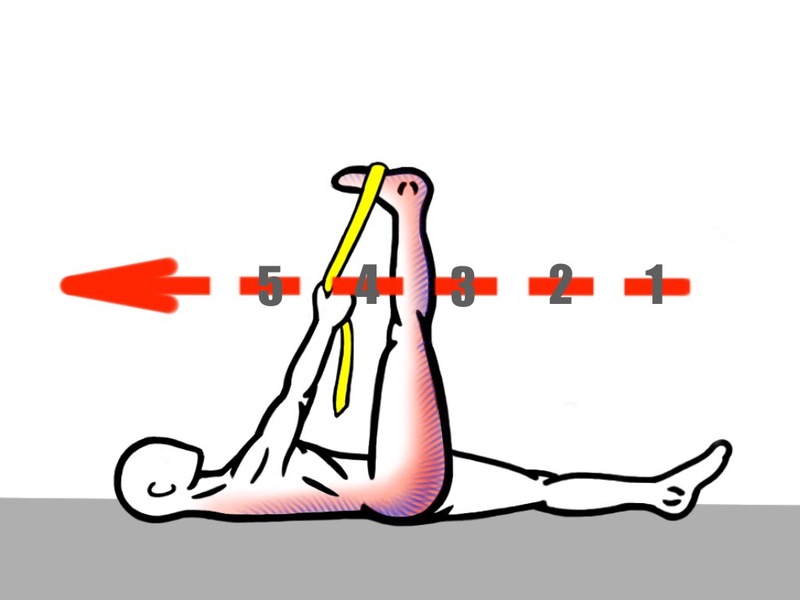 Use the band or belt to work on straightening your knee, still keeping your thigh done on your ribs. You can point and flex your foot/ankle too – you’ll feel the stretch beyond your knee into your lower leg/ankle. 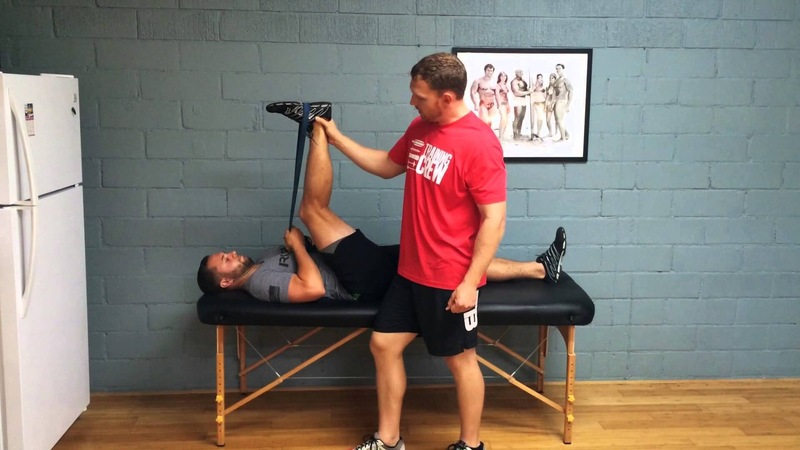 The next stretch is probably the most important – often forgotten by most gym goers. As you can see the red muscles are the ones that need to stretch. The bright red ones inside and a cross the pelvis cause a lot of problems. 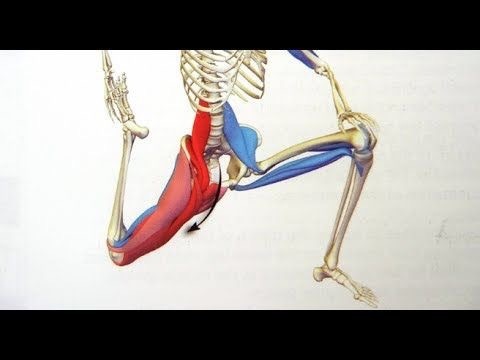 They cross so many joints in the low back, pelvis and hip that almost any action we perform – sitting, driving, running, cycling and squatting all involve these muscles. If they become short, weak and or tight incredible strain is put on your pelvis – your Sacro Illiac joint – causing it to twist or rotate out of its normal position. 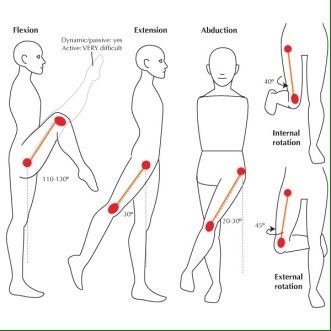 Leg length and gait can be effected. You might find you feel the need to roll your knees from side to side or ‘crack’ your back to relive the pressure. Sadly, this will only give temporary relief and may even make your imbalance worse! This deep kneeling stretch should be a regular ‘hangout’ for you and when you can, you should raise your arms up above your head. Try using a doorway to support your back and then reach your hands up along the frame. Build up to 3 minutes a side. 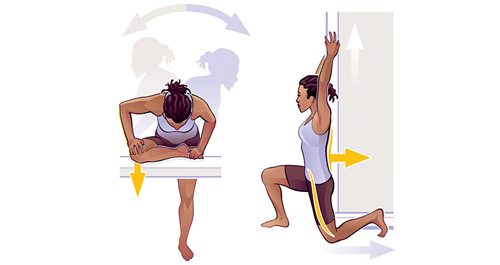 Stretches done you can focus on joint mobility – these exercises can be done as part of you’re Pre-Hab warm up. I call this one the carpet fitter mobility. Start on all fours, ram your knee against your ankle – so that your shin moves across the floor underneath you. Stack your hip directly over your knee and then explore the corners. Remember it’s not a stretch – it’s a mobility move , so push in and out to feel pressure, stretching or maybe even slight pain in your hip joint capsule. 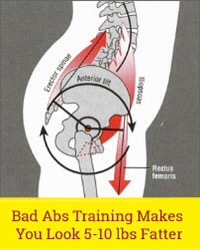 Or aim here is to release any tightness that’s built up and get dramatic improvement in your range of motion. It may take sometime doing your other exercises before you can sit as low as Kelly – shown here. This is another ‘hang out’ position. With heels down – no cheating with high heel training shoes!- feet pointing forward is your target. Apply a little pressure on your knees with your elbows – rock and grind into your hips , keeping your feet planted and your chest up. Sit sideways on to a mirror if you can, look at the shape of your lower back. Ideally it will have its natural curve, in a strong but soft curve, rather than your bottom tucking under. 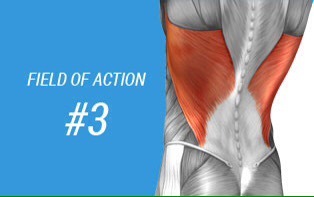 The other factor in your framework is that your back extensors a are trying balance the tension in your hip flexors If you feel along your low back, either side of your spine you may notice more tension one side than the other. You can use a firm dog ball, cricket or hockey ball or foam roller if you have one to lie on and release these tight muscles. Using a small ball as shown here takes some courage” if you can find a foam or inflatable soft ball about the size of a small Melon you can use that under your belly along with deep relaxed breathing to get good results and release your lower back too. You will hold these positions for 5-20 seconds while relaxing your breathing pattern so that your belly rises and falls with each breath. 3. Lift one knee above your hip while pushing same side elbow into the floor close to your ribs. 4. Hover one foot off the floor – keep it as close to the floor as possible. Do these exercise on both sides and increase the repetitions to a point of failure every time your practise them. Do these exercises daily, let me know how you get on.